For a while now I've wanted to organise a meet-up, especially as most of them seem to happen in London. 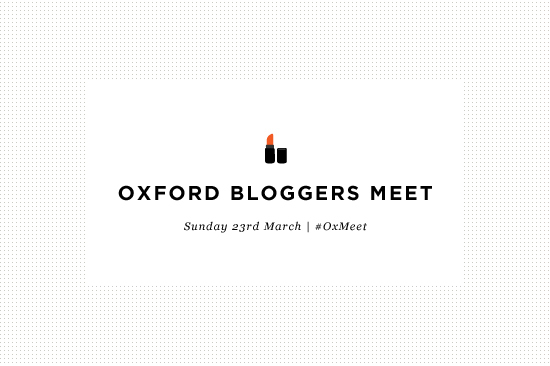 I figured it was about time to get all the amazing Oxfordshire bloggers together and have a natter, grab a coffee and do a few beauty bits between. So #Oxmeet is a go! What? A beauty blogger meet-up in Oxford city centre. When? Sunday 23rd March @ 2pm. Where? We'll meet at Zappi's Bike Cafe (on St Michaels St and has all the bikes out the front) as I figured it would be good to have a coffee first, take the edge off the first meeting and give everyone a chance to get into Oxford. Plus, Zappi's do the best coffee in Oxford (without doubt). If people are running late then it gives a bit of a breather, but we won't be staying there all day! A bit closer to the time I will give my phone number for anyone that can't find the venue. Additional? 3pm I'll be whisking us all off to Crabtree & Evelyn where the lovely staff have offered hand massages, trialling the products and manicures from the new range. How amazing is that going to be? 6pm We've got a date with LUSH. We'll be given a tour, have skin consultations and readings, as well as some other goodies and surprises that they'll have up their sleeve! We can grab a bite to eat at Wagamamas during the day as at least the tables are better suited for people to get to know one another. More TBC, so watch this space! If you'd like to come, send me an email adrienne@latenightnonsense.com, drop me a tweet @_L8NN or message me on Facebook.